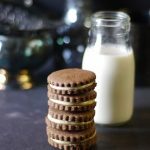 Delicious gluten-free, vegan chocolate sandwich cookies, filled with natural maple butter. Refined sugar-free and oil-free. Preheat oven to 350F***. Line a cookie sheet with parchment and set aside. Process all cookie ingredients in a food processor until the mixture begins to form a ball****. Form the mixture into a ball with your hands and knead briefly, then flatten into a disk. Place the disk between two sheets of parchment paper on a flat surface and use a rolling pin to roll out into an ⅛” thickness. Use a 2″ round cookie cutter (this is the kind I used here) to cut out as many cookies as you can — carefully transfer those onto the prepared cookie sheet. Gather remaining dough scraps, form into a ball, and repeat the process of rolling out and cutting out more cookies until you run out of dough. Note: I got about 12 2″ in diameter cookies, which makes 6 sandwich cookies. Bake in a pre-heated oven for 10 mins (or bake longer for slightly crispier cookies to your liking, just keep an eye out that they don’t burn). Remove from oven and allow the cookies to cool a few minutes (they will seem on the soft side at first but will firm up a bit as they cool off). Once the cookies are fully cooled off, flip one cookie upside-down, place about a third of a tsp of maple butter in the center of it. Cover with another cookie and gently press down to make a sandwich. Be careful not to overfill the cookies so the filling doesn’t spill out over the sides too much. Enjoy! **Maple butter / maple cream should be made of 100% pure maple syrup. ***Note: you can also bake these at 375F, which results in crunchier / drier cookies. ****The texture of the dough can be different depending on the cashew butter used. For example sometimes you might get a batch that’s more “oily” other times one that’s more dry + brands vary, etc. The dough should be soft and pliable. If for some reason the mixture feels too sticky at this point, add a bit more flour and process again to incorporate; if too dry, add a bit more maple syrup or cashew butter (or even a little splash of water). I just add a tsp of flour or liquid at a time, for instance, until the consistency is just right.